Three administration officials confirmed to Breitbart News that there were no immediate plans for the president to visit the border while the Senate debates a DACA deal, although they did not rule it out in the future. In 2017, Trump repeatedly expressed interest in visiting the eight border wall prototypes constructed on the border in San Diego. “I’m going to go out and look at them personally, I’m going to pick the right one,” Trump said in September during a political rally in Alabama. During a cabinet meeting in December, Trump said that he “may be going there very shortly” to view the finished prototypes. But no border trip has materialized. An Axios report that Trump postponed a planned trip the border to January 30th did not happen. The president has not returned to the border since he was elected president. Early in his presidential campaign, Trump made a big media splash by visiting the border in Laredo, Texas, where he met with border patrol agents and talked about illegal immigration. Trump visited a border patrol facility in Yuma, Arizona after he was elected president, but did not travel to the border for “security reasons,” according to officials at the time. Instead, he met with border enforcement officials in a hanger and looked at some of the equipment used to patrol the border. The White House has tried to highlight the importance of national security and tough immigration reform, but the events have been restricted to briefings and meetings in the Washington, DC area. 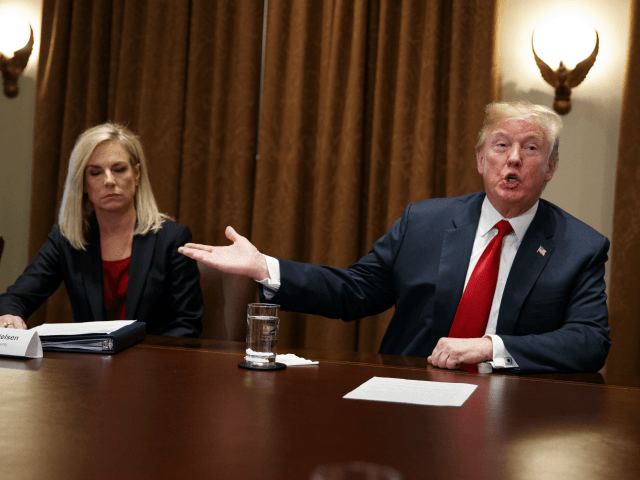 The president kicked off February by traveling to the Border Patrol National Targeting Center in Northern Virginia for a roundtable meeting with Department of Homeland Security Secretary Kirstjen Nielsen. Nielsen presented Trump with graphics of how border walls work. “We’ve seen it, we have evidence, we know that they work,” Nielsen said to an approving Trump. On Tuesday, Trump met with the National Sheriffs’ Association for a roundtable meeting at the White House. A week before that, the president met with Law Enforcement officials to discuss the dangers of MS-13.